Cervical pleura is the topmost part of parietal pleura, inside the root of the neck which spreads out nearly 1 inch or 2.5 cm superior towards the medial end of clavicle as well as 2 inches or 5 cm superior towards the 1st costal cartilage. It is called cupola and the apex of the lung is enclosed by it. Therefore, extreme care should be taken when this area is penetrated with anesthetic needle. 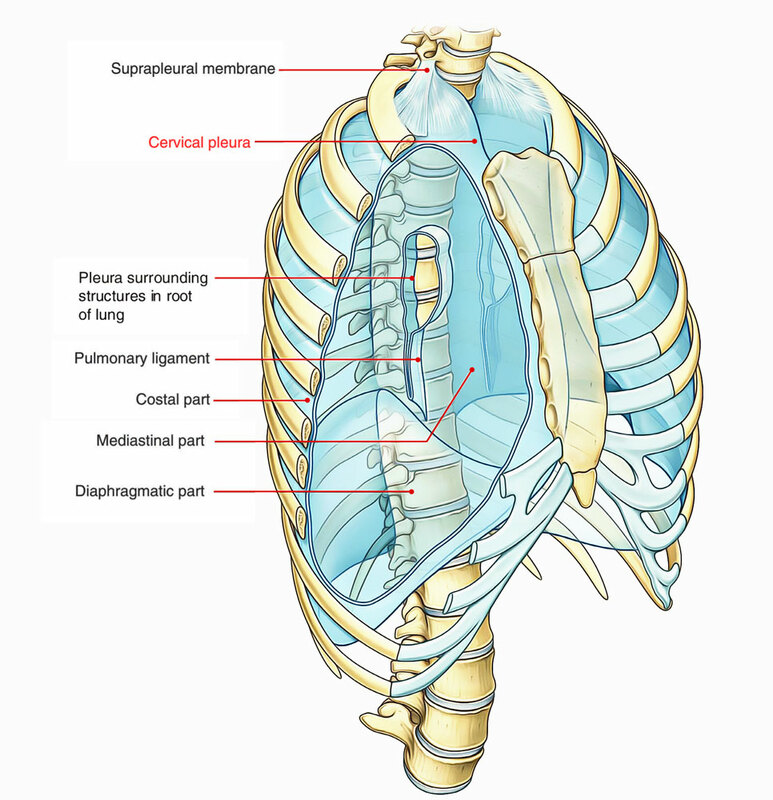 It is enclosed by the suprapleural membrane. The scaleus anterior envelops the anterolateral part of the dome of the pleura, parting it from the subclavian vein that terminates at the medial border of the muscle. The subclavian artery traverses directly superior towards the vein the dome below its peak, and from the subclavian the vertebral artery rises above it. The internal mammary artery goes downwards from the subclavian after it travels behind the innominate vein. The costocervical trunk arcs towards the back from the subclavian and goes across the summit of the dome. Its superior intercostal branch goes downwards behind the dome, in the middle of the first intercostal nerve on the lateral side as well as the first thoracic sympathetic ganglion on the medial side. The vagus nerve goes down on the right side in front of the medial part of the subclavian artery. Its continuing laryngeal branch turns around the lower border of the artery. The ansa subclavia is located towards the lateral side of the recurrent nerve.